Blue Seas is a member of Blue Planet Fleet. 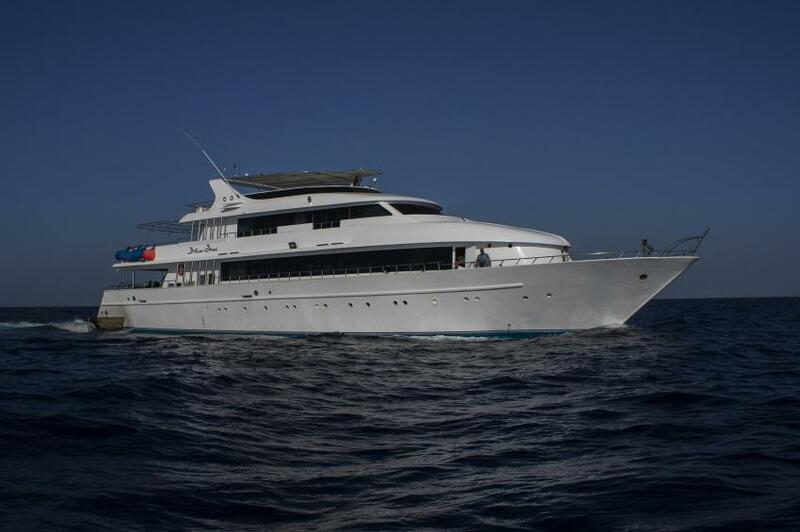 Boat was launched in 2004 since then boat offers safari tours on the Red Sea. Blue Seas can accommodate 20 persons. There are 8 twin cabins that can be shared with another diver and two suites placed on upper deck. Cabin are spacious and comfortable, all have private facilities and air conditioning. To relax after diving day Blue Seas Liveaboard can offer to stay on one of the two sundecks. They are partly shaded. If you prefer to get som tan and enjoy the warm sun, they are perfectly suits for you. Sun decks equipped with sun loungers. Blue Seas Liveaboard was designed to suit divers needs. Sun deck is large and has storage boxes for equipment. There are facilities to prepare for the dive and to maintain equipment after. Nitrox membrane would be useful for divers with EANx certification. Safety on a board of Blue Seas is ensured by all necessary equipment. Crew team is experienced and knows how to manage emergency situations. Boat equipped with DAN oxygen kit, fire alarm. emergency rafts and life vests. Blue Seas offer itineraries that can suit divers with all levels of certification, whatever you a novice or advanced diver. St. Jons is a marvelous colorful corals. Also, it's a perfect place for those who want to dive with sharks. Several types of sharks can be often spotted here, including hammerheads. Another famous route that Blue Seas offers is Brother Daedalus Elphinstone triangle. Explore the amazing coral forest of this diving destination. High season for diving in Egypt begins in Autumn – it’s not so hot already but the water is still warm and full of marine life. In winter water temperatures can be rather cold. Summer temperatures reach 40 C. Conditions in the Red Sea is always suitable for diving.